sponsored by the Ottawa Buddhist Society. 27 – 29 April, Fri-Sun: Non-residential retreat with Ajahn Viradhammo in Toronto. 1:30 – 4:30 pm – meditation, Dhamma talk and Q&A. 05 -28 June: Ajahn Viradhammo visiting and teaching in B.C. One of the direct Western disciples of Ajahn Chah and currently the abbot of Amaravati monastery in the UK. Ajahn Amaro founded Abhayagiri monastery in California and was co-abbot there with Ajahn Pasanno for 14 years, is author of several books on Buddhism, and is a wonderful teacher and friend of Tisarana. 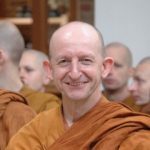 Read a more complete biography for Ajahn Amaro here.